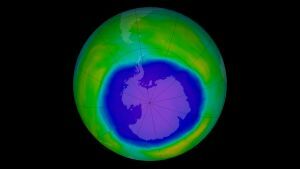 A little over three decades now, world communities banded together for a historic deal to keep a hole from the ozone layer from growing. This international treaty, known as the Montreal Protocol, banned the harmful chemicals that were thinning the Earth’s natural ozone barrier that protects us from the sun’s ultraviolet radiation. Now, a study recently published in the European Geosciences Union journal Atmospheric Chemistry and Physics suggests that ozone layer recovery in lower latitudes isn’t going as expected. Specifically, the ozone layer in middle to lower latitude areas — where most people live — show unexpected decreases for reasons still unclear. The results could be the sign of a problem with how atmospheric circulation models have been designed so far. But the ozone layer could also be getting thinner because damaging substances such as chlorine and bromine slipped through the cracks, and were not regulated under the Montreal Protocol. “These [substances] are increasing but are not included in the models,” Bell said. “It’s not that the models are wrong. It’s that the scenarios we’ve set up aren’t correct. We would have to update these.” The so called “very short live substances”, of which chlorine and bromine are examples, have previously been ignored because they’re not supposed to be able to survive long enough to reach the ozone layer. “This is something we need to investigate as well, and modeling should be done on this,” Bell added. One thing is clear, however. The still unexplained decrease in low altitude ozone shouldn’t be taken as a failure of the Montreal Protocol, which, by 2030, will be responsible for a million fewer cases of skin cancer per year. The protocol is also helping fight climate change: from 1989 to 2013, the measures it prescribed helped avoid 135 billion tonnes of climate warming emissions. That’s equivalent to about 5.6 billion tonnes of CO2 emissions yearly. Moving forward, further actions against climate change — like the Paris Climate Agreement — should require nations to be a bit more alert. At least, “continued monitoring of the system is required,” Bell explained, to make sure that targets are on track and that unexpected environmental factors are checked. “This is important,” Bell stressed. “We really have to continue monitoring both the ozone layer and the climate system in general to update our models,” because new threats could be emerging, he said.